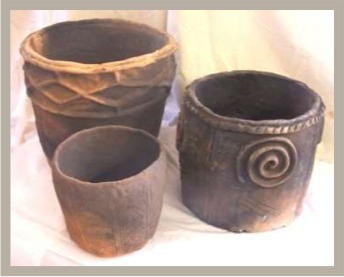 Neolithic Pottery Firings | Harray Potter Ltd. The embers are covered with a layer of fuel. The vessels are then introduced, layer by layer, with the number of layers dependent on how many pots are being fired. Each layer of pots is covered with fuel before the next layer is added. After the last layer of vessels is in the kiln, a dome of fuel is added. The fuel dome is, finally, sealed with a wet layer of fuel, either cattle dung or seaweed. Once loaded and sealed, the kiln is very largely left to its own devices. During firing the kiln is constantly monitored, with temperatures recorded on a regular basis. No two firings have been the same; each time, the kiln behaves in different ways, performing to its own internal logic. This is partly caused by prevailing weather conditions at the time of firing, partly by the different fuels used, and partly by the presence/absence/amount of oxygen circulating in the firing chamber at any one time. A range of different fuels have been used. The first three firings were predominantly peat, with smaller quantities of sheep and cattle dung. 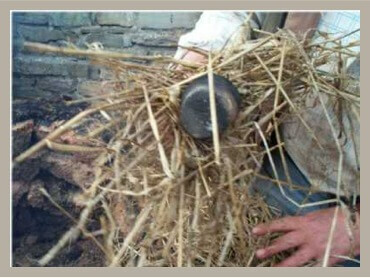 The most recent firing, however, used a mixture of dry garden vegetation, wood, wood shavings, a small amount of peat, sheep dung mixed with straw, and semi-dry seaweed. In this firing, seaweed was the main fuel. 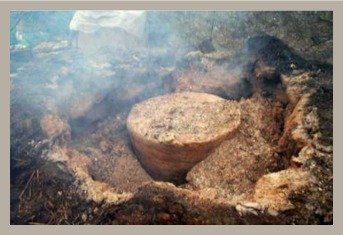 The use of peat resulted in long firing times, upto 36 hours, but achieved temperatures of around 1100 degrees centigrade. This reflects, on the one hand, the slow burning nature of the material and, on the other, the potential of the peat to reach very high temperatures. The last firing was much shorter, taking around 10 hours to complete, reflecting the quicker combustion rates of the materials used. There is uncertainty amongst archaeologists about the temperatures to which prehistoric pottery was fired, with many assuming that low – between 600 and 800 degrees centigrade – was the norm. Firing pots to these temperatures, using Orkney clays, does not work: the pots are very underfired, often breaking during firing, and, those that do survive, cannot be used effectively. The aim of this part of the research, with a programme of scientific analysis in place which is looking at both pottery from the archaeological record as well as experimental pieces, is to come to some definitive assessment of firing temperatures.